Find a Parker House retail store in your local area using our dealer locator. 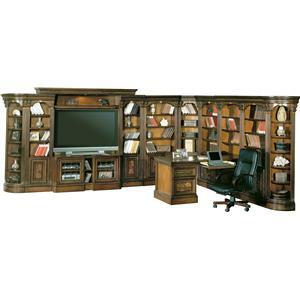 Need a workspace for your laptop, but don't want to lose the upscale, luxurious look for your office? 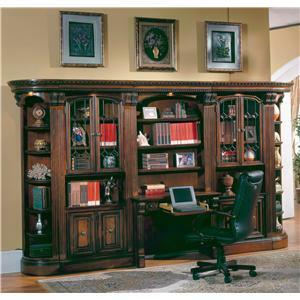 This library desk and hutch is a great answer that gives you the perfect space for your laptop plus open shelving for book storage space to display your favorite personal items. 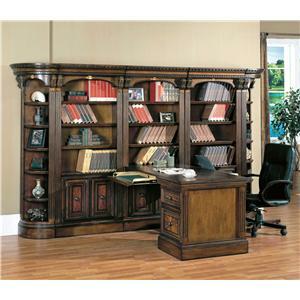 Comprised of two (2) glass door bookcases, two (2) outside corners, and the desk and hutch, this neat combination piece is a wonderful storage solution and would be a beautiful addition to any office in need of a rich, traditional look. 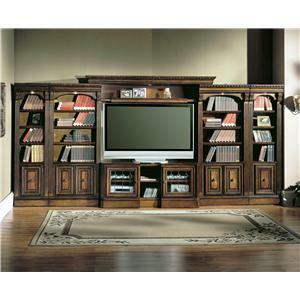 Eighteen (18) open shelves give you ample amounts of storage and display space for books, personal items, or art pieces. 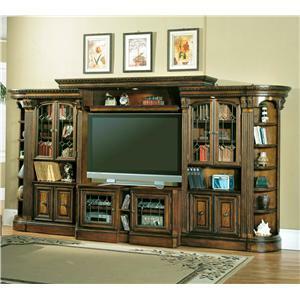 Six (6) additional shelves are behind four (4) glass doors, perfect for storing or displaying your more valuable or delicate items, or even for storing wine! 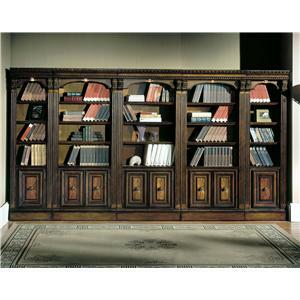 Four (4) lower doors and two (2) drawers provide closed storage space as well. 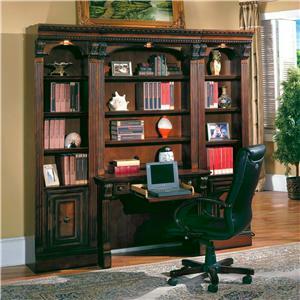 The best part about this large laptop bookcase desk is that it maintains the beautiful detailing and warm depth of the collection, so it creates a full wall unit and bookcase storage unit for your home office that will transform your space into a luxurious traditionally designed personal library and workspace. 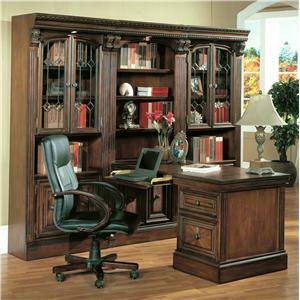 The Huntington Large Bookcase Desk and Hutch by Parker House is available in the area from FMG - Local Home Furnishing. 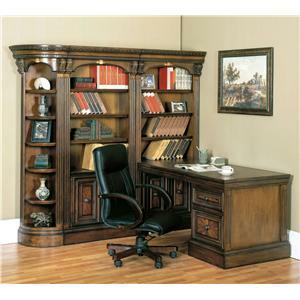 HUN#450 Outside Corner 2 17.75" 17.75" 80.25"
HUN#440 Thirty-Two Inch Glass Door Cabinet 2 32.25" 17.75" 80.25"
HUN#460-2 2 Piece Library Desk 1 40.5" 21" 80.25"
The Huntington collection is a great option if you are looking for Traditional furniture in the area. 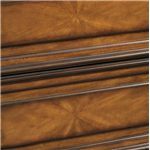 Finish Finished in a multi-step Chestnut tone with accent shading and highlights, hand distressing, and a medium sheen top coat. 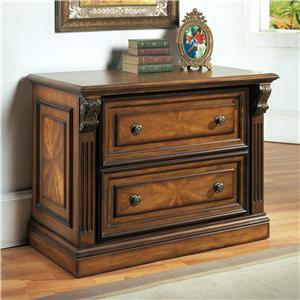 Handles & Hardware Simple metal drawer and door pulls showcase the intricate traditional styling and details in the collection. 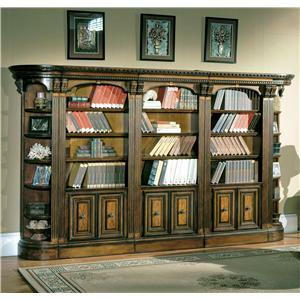 Case Detail Thick base moldings and the thick dentil molding that is used on on the crown adds to the English Traditional style of the collection. 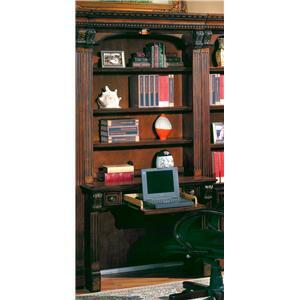 Drawer / Shelf Construction Drawer boxes are English dovetail construction, both front and back for added strength and durability. 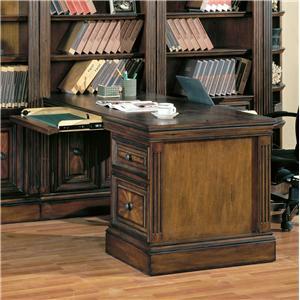 Drawer Suspension All drawers have easy access from side mounted, deluxe, full-extension, ball-bearing slides. 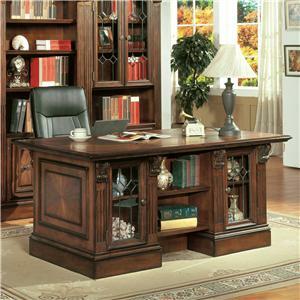 Wire Management Lap-top connection ports are built into desks for easy access, and there is hidden wire management inside desk walls. 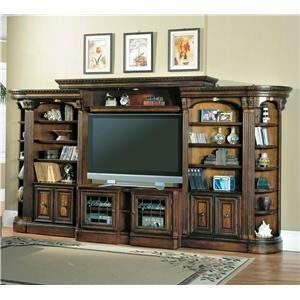 Case Construction Constructed from Poplar solids with Maple veneers and carved accents, and leaded glass door inserts with beveled diamond pattern. 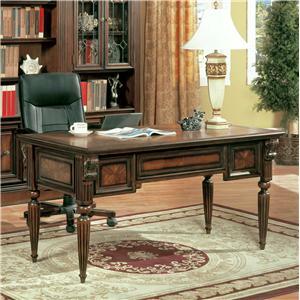 Browse other items in the Huntington collection from FMG - Local Home Furnishing in the area.